The number one gymnastics podcast in the world! Our new podcast about the Gabby’s Douglas realty show Douglas Family Gold on Oxygen. Watch the first episode of Douglas Family Gold here. Is it really true that scores go up as the day goes on or is that another gym myth that needs to be busted?! We discuss the best parts of TingTing’s routines from Chinese nationals including her legit, handspring front on beam! AH-MAZING! The situation in Romania is just getting worse and worse. A petition was launched to re-investigation the allegations. 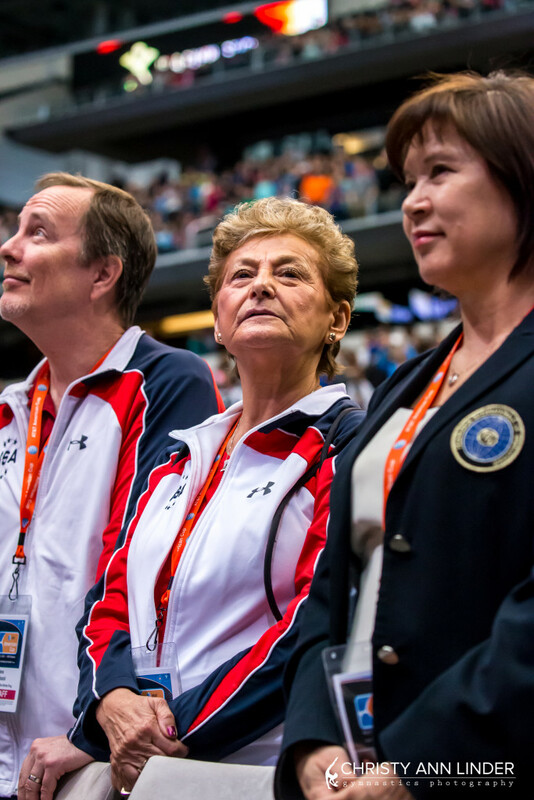 Associate head coach, wife of Jeff, Rachelle Thompson is stepping down in June. The true test of a sports bra’s effectiveness. Best sports bra’s Babble list, TitleNine list. The Enell Sport bra, also known as, “The bra of last resort” is a personal favorite of Jessica’s . Your reactions to our posts this week including, 12-year-old Jaymes Marshall’s Amanar, the Betty Okino interview and MyKayla Skinner’s quad wolf turn. 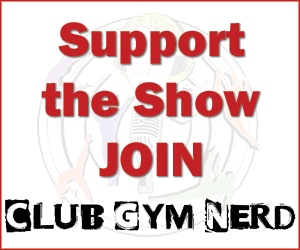 Join Club Gym Nerd here. Buy one of our awesome shirts here. There was a video on Twitter after the weekend at The Ranch where Marta calls Simona a \”brat\” with a smile on her face. Off topic, Trautwig went after a few posters when they admonished him on Twitter. There was a minor back and forth where he was being a jerk. NannningBee knows more about it than me. I spend too many hours of my life hating on AL and saying ” you know Nothing AL Trautwig” Even when you try to make fun of him he doesn’t get it and turns into a old belligerent white dude. Ugh. Another major story coming out of Chinese Nationals (besides the naming of the Olympic team) was that Shang Chunsong looked absolutely incredible. She was so confident and consistent, and it looks like she will be a medal contender on beam, floor, bars, and in the AA. She scored a 60.2 AA in quals 59.550 in finals. I think she has more medal potential than any gymnast besides Simone, which is pretty crazy. Just FYI I am fairly (very) confident that Manrique\’s name is pronounced \”mahn-ree-kay\” – his last name is French (probably Haitian creole origin?) but his first name is straight up Spanish (it\’s actually a Spanish surname usually) and there is no way any Cuban person would pronounce it \”mahn-reek.\” Not sure why he laughed when you tried saying his name – maybe he was just laughing at the confusion. PS I have followed you guys on social media but tonight was first time I heard your podcast. Liked it allot. Looking forward to hearing more. A good bra is so important! I remember wearing 1-3 compression sports bras over my regular bra when participating in sports in high school. I got my first Panache Ultimate Sports bra right as I started adult gym and with just the one bra I had near zero movement even on trampoline!! It goes down to a 28 band size which is great (I\’m a UK 28ff in that bra), even among the other high quality brands that can be a band size they don\’t make. THANK YOU for explaining the origin of the ranch/bonfire/marshmallow photo. It popped up on my Instagram feed and I was so confused. I can\’t imagine they actually got to eat them?? Obviously going through withdrawal and listening to all of the old podcasts on repeat. I would love to hear you guys eventually go back to some of the gym myths and discuss how the Olympic prelim order played out in Rio. For example, Jess and Spencer were confident (as was I) that China going in the first rotation wouldn\’t affect their chances to qualify into bars event finals, but we all saw what happened with that. I read some people complaining about the Chinese form on bars but I really didn\’t see a difference from their prelim and finals/all around routines (and those latter scores were sometimes much higher). I know there were different judges on some of the days, but would love to hear your thoughts on what went on there. PS I discovered this podcast a few months ago and it has literally made my summer, like Moceanu inner tube level of bliss. Love you guys so much and thanks for all that you do!.